From the very beginning, D. W. Onan did not have ambitions to develop his business into a giant operation. It wasn’t that he had a grand scheme to grow to about 100 employees in one modern, spacious plant and then stay that size. Onan’s long-range game plan was much more vague. He wanted a business that was small enough so he could walk around the plant and greet any of his workers by name, know their problems and goals and chat with them as a friend. He wanted a business big enough to provide him and his family a comfortable living but small enough so that he and his sons. Bud and Bob, could run all aspects of it. There were times during the formative years of the 1920s and especially during the depression years of the 1930s when some of Onan’s suppliers, his financial backers and even some employees wondered if the company would even survive. But D. W. Onan himself was always supremely confident the business would succeed, and even though he was impatient occasionally about the early growth, he never doubted that eventually he would have the size company he wanted. The year 1940 probably came closest the Onan’s idea of the perfect- sized business. The Onan Company produced 3,540 generator sets that year, it had about 100 employees, and total revenues were $855,846. The next year the U.S. entered World War II and the desperate needs of the military for dependable portable electric plants took top priority, and D. W. Onan completely lost control of his plans for orderly growth. During the next five years, Onan was manufacturing as many as 70,000 generator sets annually, had as many as 2,500 employees in five different plants in the Twin Cities, was sub-contracting work to 82 other companies with 5,500 workers, and had annual sales as high as $50 million. From the beginning of 1942 through the middle of 1945 all of the Onan company’s production went to the U.S. military and its allies. The Onan Company wasn’t alone in the abrupt switch from peacetime operations to frantic military production. Manufacturing companies throughout the country that could possibly handle items needed for the war went through the trauma, and Minnesota firms especially were affected. U.S. military officials were concerned that locations on both the East and West Coasts would be vulnerable to enemy bomber attacks, and they chose sites in interior states whenever possible for defense production. Minnesota was an ideal state, located far away from both coasts, and it had hundreds of efficient plants that could convert their facilities to making wartime goods. Even in November 1941, the month before the U.S. officially declared war on Japan and Germany, Minnesota companies were awarded $346 million in defense contracts. Military production by firms in this state totaled billions of dollars before the war ended. Minneapolis-based Honeywell, for example, produced aircraft controls and, later, even bombsights. General Mills, Pillsbury, Green Giant, Geo A. Hormel and other Minnesota food companies, switched to making products for the growing allied military force around the world. The 3M Co. in St. Paul manufactured a variety of military goods. Minneapolis Moline and the St. Paul branch of International Harvester converted from farm equipment to producers of armaments, and the Ford Motor Co. assembly plant in St. Paul built military vehicles. There were seven large shipbuilding yards constructed in Duluth, and the Cargill Co. built Navy tankers at facilities near Savage. Military officials even had a government-owned arsenal in the state, the Twin City Ordnance Plant at New Brighton, which produced ammunition 24 hours a day, seven days a week. Most of the manufacturing facilities that switched to wartime production didn’t experience the rapid expansion that the Onan company had, but a few had even more dramatic growth. The Northern Pump Co. in Minneapolis, for instance, was a small firm with 50 employees making fire engine pumps in 1940. Before World War II ended. Northern Pump, whose name was by then Northern Ordnance Co., was in a $20 million plant in Fridley with 15,000 workers, manufacturing gun mounts and related equipment and machinery for the U.S. Navy on an around—the-clock basis. It was the Navy’s largest ordnance producer and early in the war it was the country’s largest defense plant that had started from scratch. One of the reasons the Onan company experienced such tremendous growth during the war was the fact it became involved in military production more than two years before the Japanese attacked Pearl Harbor on Dec. 7, 1941. Onan’s first major military customer was Great Britain, starting in 1939. Unable to find dependable portable power plants either in their own country or in Europe, the British turned to Onan for hundreds of small A.C. generator sets for military radio transmitters and other communications operations. The British also needed a special direct current generator for charging batteries. The British military had high praise for the equipment purchased from Onan, especially because of its trouble-free operation and its durability. The word was passed on to U.S. military authorities, who were making plans for a quick buildup of defense equipment in the very likely event America would get involved in the war. The first orders from the U.S. military came in late 1940 and early 1941, and even though the Onan reputation was well known, some very stringent testing was required before any units could be shipped. 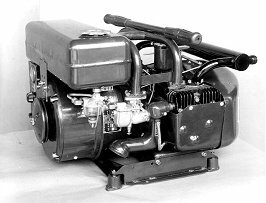 In January 1941, the Onan company received an order from the U.S. Army for 400 small generator sets, provided that a prototype of the set could pass a 1,000 hour endurance test. The test ended in the middle of the night and the government inspector was due at the Onan plant the next morning. An anxious group of Onan workers, including D.W. Onan, carefully checked out the tested equipment, but not knowing the requirements, they could only hope it passed. When the government inspector arrived in the morning, he checked the tested unit and then suggested they grind the valves. When that was accomplished, he said he was more than satisfied, and that if grinding the valves was all the maintenance it needed after 1,000 hours there was nothing to worry about. D. W. Onan’s honesty had paid off once again. With the U.S. military orders coming in on top of the British demand, plus the civilian business, things were beginning to get hectic at the Onan plant. In January 1941, Onan produced 269 units with 147 employees, but the volume increased each month during the year climaxing with December business that saw 1,011 generator sets manufactured. The Onan company now had a crew of 324 workers. Onan sales in 1941 totaled $2.9 million compared to less than a million dollars the year before, but the real growth was yet to come. Revenues in 1942 jumped to $14 million. They reached $32.5 million the following year and approached $50 million in 1944. As men and machines were added at the Royalston plant, conditions became so crowded it was difficult to find an aisle to walk down. More space was desperately needed, and there simply wasn’t time to construct a new building large enough to handle all production. In the first two years of the war, as production increased each week, D. W. Onan expanded the Royalston plant as much as possible, and then leased four other buildings in Minneapolis. These included one that had been used by the Caterpillar Tractor Co. as a manufacturing plant. The U.S. government condemned the facility on the grounds it was being used for civilian production and made the building available to Onan on a lease basis in the summer of 1941. The plant, located at 2515 University Avenue Southeast, was purchased by Onan in 1944. Other buildings leased by Onan during the war years included the Highland plant across the alley from the original Royalston facility, the Arrowhead plant at Stinson Boulevard and Broadway Street Northeast, and the Madison plant on Madison Avenue Southeast. With all five plants, Onan had manufacturing floor space equal to six city blocks, but it still wasn’t enough to handle all the government orders pouring in. Much of the engine production that Onan couldn’t handle was sub-contracted to the Continental Motor Co. in Muskegon, Michigan. One of the major headaches throughout the war years was the great variety of equipment needed by the various branches of the military. 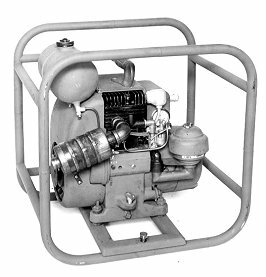 Onan produced 65 different models of generators and 40 types of internal combustion engines to drive the generators. There were 41 separate branches of the armed forces ordering generator sets from Onan, ranging from 350-watt to 35,000-watt units. Many of the parts going into the generator sets were made by more than 80 subcontractors for Onan. Space to assemble the generator sets wasn’t the only problem. Scarce equipment was needed, and there wasn’t time to wait for it to be built. In the first several months of the war, the Onan Company bought more than 700 pieces of used equipment and machine tools and converted them for its use. More than 200 new pieces of equipment also were purchased as they became available. 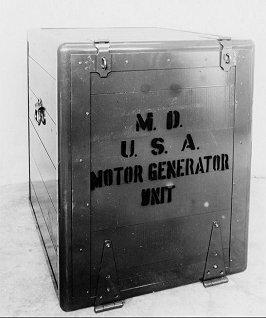 Onan generator sets were used in literally hundreds of different applications by the military, including those used for lights for surgeons in field hospitals, for X-ray machines, for mobile telephones and radio communication, for mess halls, weather bureaus and to operate electrical equipment on large guns, radar equipment and PT boats. More than half of all the portable electric plants used by the allied forces during World War II were produced by Onan. Onan quickly established a reputation with the military as a resourceful and imaginative company, qualities the government badly needed as it raced from one crisis to another. In the early days of the war, military officials promised D. W. Onan he would not have to worry about getting critical supplies, the necessary plants, manpower or financing, because war production took top priority and the U.S. government would see that Onan had everything it needed. Unfortunately, it didn’t work out that way. Other than condemning the Caterpillar plant near the University of Minnesota for Onan’s use, the government rarely was effective in getting things accomplished in time for Onan to meet its tight schedules. Part of the reason was the impatient attitude of the people at Onan. While waiting for government action, they usually went ahead on their own and did what was necessary. This so impressed the military that they more and more tossed tough problems to Onan, knowing that somehow they would get solved. A good example was the assignment the Navy originally gave to Westinghouse, but the task was solved only after Onan stepped into the picture. Early in the war, the U.S. Navy needed a way to keep track of what the Japanese were doing on the Pacific Islands they had captured. The Navy asked Westinghouse to make some portable, waterproof radio transmitters that could be dropped from destroyers into the ocean near these islands. U.S. spies on the islands would then pick up the radios, using small boats, smuggle them ashore and set up secret surveillance stations. They then could report Japanese activities on the islands to the U.S. So, from his surreptitious visit to the airbase and the information obtained from an academic paper, Hoiby and his men were able to design and build a dependable 800-cycle generator set, and the Westinghouse project was a success. It seemed that every time Onan solved a tough problem for the military, it gave them reason to hand Onan even a tougher problem. Jack McFail, manager of Experimental Department at Onan during the war, says, “The military kept us plenty busy, all right. They wanted maximum life and minimum service. They pushed us to extend the time that our units could run before they needed oil added or changed. Every quart of oil had to be shipped in, so it was always in short supply. When we’d lengthened the time our sets could run without service from 100 hours to 200 hours, they wanted 400. When we gave them 400, they wanted 800. One of the big bottlenecks during the war was getting the necessary parts from suppliers to keep production flowing. It was especially hard to get enough magnetos and governors for the generator sets in the early months of the war. Jim Hoiby remembers the Onan production manager came storming into his office and said they just couldn’t meet delivery schedules with those items short all the time. Hoiby paced up and down for a few minutes, and then said, “All right, we just have to build our own magnetos and governors.” He called a few of his engineers together, told them the problem and within a few weeks, Onan was manufacturing its own magnetos and governors in the quantities needed to keep production on schedule. Rings and cylinders also were in short supply most of the time, but it was just impossible for Onan to manufacture every part that was needed for assembly. Whenever possible an outside supplier was used, even if Onan had to set one up in business. Paul Millerbernd, a blacksmith at Winsted, Minnesota, a small town west of the Twin Cities, came into the Onan plant one day early in the war and said his small business had been cut off from its steel supply and there was nothing for him to do. The people at Onan handed him a generator frame ring and asked, “Could you make this if we supplied the steel and the machines to do it?” Millerbernd took the ring back to his shop, worked all night, and came back the next day with one he had made. It was perfect. Millerbernd didn’t have the equipment to mass produce the rings, however, so he and D. W. Onan made a trip to Chicago where they found a used piece of equipment that would do the job. Millerbernd also didn’t have the $10,000 the machine cost, so Onan bought the machine and let Millerbernd pay for it over the next few months as he received payment for the rings he supplied. Finding enough manpower during the war also was a major problem for the Onan company. It was not only necessary to hire enough people to keep pace with the growing number of orders, but hundreds of Onan workers were called to military service. During the 1920s and 1930s, the Onan company was constantly in financial trouble, and the war corrected that to an extent, but the tremendous growth didn’t make the company or the Onan family as wealthy as you might expect. D.W. Onan, who didn’t, or couldn’t, use the banks for financing during the depression years, was a regular (and favored) customer during World War II. His backlog of military orders was all the collateral needed to get any loan he wanted. But the government made certain that no business would find it easy to get overly rich out of the war effort. Excess profit taxes by the federal government claimed nearly all earnings over a modest amount, and even top executives were limited to what they could earn. President Franklin Roosevelt ordered early in the war a flat limit of $25,000 a year in salary for any executive in the U.S. to make certain no one would benefit too much from the crisis facing the country. Extraordinarily high personal income taxes also made it difficult for an individual to keep more than a modest amount. In many ways, however, World War II was a boon to the Onan Company. It gave it valuable expertise in generator technology, it spread the Onan reputation to millions of additional people throughout the world, it allowed the company to amass equipment and plants it could use after the war, it opened up financial relations with banks, and it put the company in the soundest condition it had been in since it was founded. But the war produced many negative results, too. D.W. Onan was forced to run a company many times larger than he ever wanted, and even though he and his sons. Bud and Bob, and their top managers had to work long, hard hours seven days a week, they benefited only modestly in a financial sense. Also, there was a constant, gnawing concern on the part of the Onans that when the war ended, and all military production was abruptly halted, the company would face a serious crisis — one that easily could kill the business. How could Onan possibly survive with its gigantic overhead if sales would plummet almost overnight from $50 million a year to the pre-war $800,000 annual revenues? The Onans also were concerned about laying off hundreds of hard working, loyal employees. And would the Onans be able to find work for the more than 400 former employees who were called into military service and were guaranteed to get their old jobs back? As World War II began to wind down and thoughts started to turn to converting to civilian production again, the Onans were mighty concerned about a whole new set of problems.